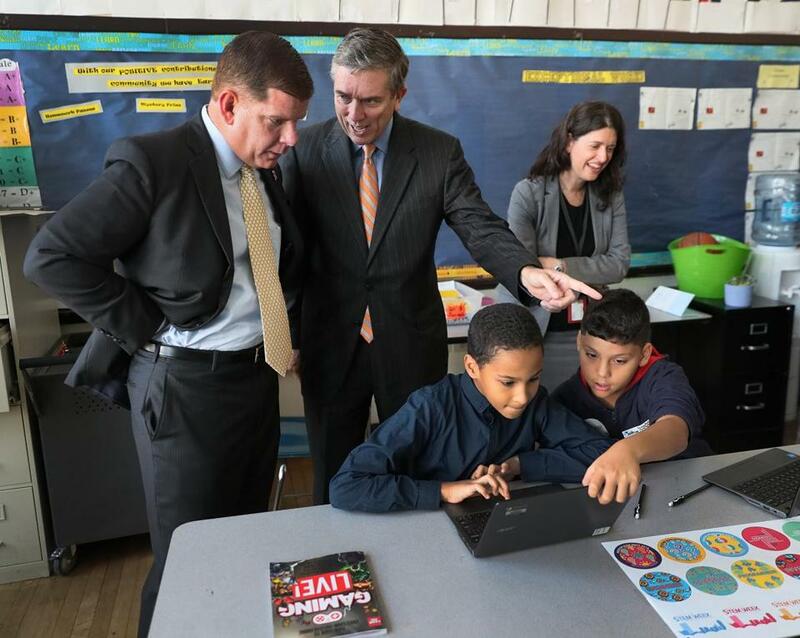 Mayor Martin J. Walsh and Boston School Committee Chairman Michael O&apos;Neill looked over students working. Michael O’Neill said Thursday that he plans to step down as chairman of the Boston School Committee, ending a five-year tenure in the post. O’Neill said he intends to hand over leadership duties to another member next Wednesday when the committee holds its annual organization meeting. It is during that meeting each year when the board elects a chairman and vice chairman. O’Neill, an alumnus of Boston Latin School who was appointed to the committee nearly 10 years ago by former Mayor Thomas M. Menino, said he plans to stay on the committee and finish out the three remaining years of his term. The change in leadership comes at a critical juncture for the 56,000-student school system. Hundreds of parents this month protested changes to school start times, forcing Superintendent Tommy Chang to pull the plan back. The school system is also looking to overhaul other aspects of its operations to save money and to help families more easily navigate the school system, such as reducing the number of grade configurations, which could result in eliminating middle schools. O’Neill said his decision to step down as chair had nothing to do with the controversy over start times. Rather, he decided to do so over the summer so he could spend more time with his family. Chang said O’Neill’s leadership would be missed. O’Neill, as chairman, played a critical role in the superintendent search process that led to Chang’s hiring nearly three years ago. O’Neill cited that process as one of his greatest accomplishments because he strived to make it as transparent as possible, including having the four finalists interviewed in public. Previous searches, under different chairs, resulted in one finalist being named as the superintendent. O’Neill said he also was proud of the improvements, during his tenure, the district has made in bolstering English language learner programs, integrating more students with disabilities into regular classrooms, and boosting student achievement, including graduation rates, which have reached historic highs. O’Neill informed his fellow members of his decision by letter on Thursday, setting off speculation over who will replace him. At least one member, Michael Loconto, expressed interest in being the next chairman when reached for comment Thursday afternoon. “I really think there is a great deal we can do to make the system more approachable for families,” said Loconto, an attorney for Curry College who has children at the Beethoven and Ohrenberger schools in West Roxbury. Loconto was the target of criticism among some parents this month who felt he was not empathetic to their concerns and raised questions about why the start times at his children’s schools didn’t change. Loconto has said that he did not know whether his children’s schools operating hours would be affected when the committee voted earlier this month to let more high schools start after 8 a.m. and dismiss more elementary and K-8 schools before 4 p.m. A day after the vote the school system revealed about three dozen lower-grade schools would begin at 7:15, creating an uproar among parents who thought it was too early. Loconto said on Thursday that he thinks the galvanization of parents over the start time issue holds real promise for increasing parent involvement in districtwide issues. He also thanked O’Neill for his service, noting he has been a constant during an era of change. O’Neill became chair when Carol Johnson was superintendent and when John McDonough served as interim superintendent. He also persisted through a transition in mayors. “He has done a yeoman’s job in that effort,” Loconto said. Loconto is one of two members whose terms are up for reappointment by Mayor Martin J. Walsh. The other is Hardin Coleman, the vice chairman who like Loconto reapplied for his seat. An official announcement on their reappointments is expected in the coming days. Other members also lauded O’Neill’s leadership. “He’s really good at listening to various points of view,” said Alexandra Oliver-Davila, a member. “Michael has done an incredible job — often a difficult one and a thankless one,” said Jeri Robinson, another member. Member Regina Robinson called it a sad day. “He’s our fearless leader and my coach and mentor in this hard work,” she said. Walsh thanked O’Neill for his leadership in a statement.